Introduction-Pocket PC to Mobile Text Messaging Software is an extensive real time program to send Bulk SMS from Pocket PC or windows based mobile phone devices to other mobile phone globally. Data Doctor’s Mobile text messaging software allows you to send Number of text messages (such as job alert notification, business campaign or meeting news, share market news, business greetings etc) to one or group of people at a time without any internet connection required. 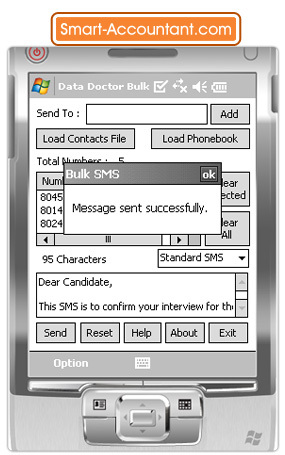 Pocket PC Bulk messaging software provides sent messages history with sending date and time for further use. Portable text messaging software is helpful for those business employees who want to send (or get) any business related information instantly using mobile phones. This GUI software utility works anywhere across the world and does not require any external device for sending text messages. Simple to access software is under in all users budget due to its cost effective feature. √ Software helps to send bulk sms from pocket pc to mobile phone at national or international networks. √ Send number of text messages to one or multiple group at a time. √ No internet connection required to send SMS. √ Simple and reliable tool works any where all over the world. √ Portable feature makes software easy to use and user friendly. √ Support all type of handheld PC or PDA devices. √ Facilitate to view sent messages history with date and time.